The following set of questions and answers are intended to help those in Canada trying to stop the CCFTA (or see to it that it stays down). Canadian Prime Minister Stephen Harper says the CCFTA represents "modern economics". Is this true? Stephen Harper’s government very nearly fell last year when it proposed a budget of tax and spending cuts at a time of recession. His claim to understand "modern economics" should be met with caution. The economic implications of the CCFTA, as outlined by Colombian Senator Jorge Robledo and, in Canada, the Canadian Council for International Cooperation (CCIC), are devastating for Colombians. "Free trade" is based on the removal of tariffs. In development economics, tariffs are understood as a tool for less developed economies to use to protect infant industries, especially in manufacturing. Free trade agreements that remove tariffs favor the more developed economy which can produce manufactured goods more cheaply due to more intense capitalization. No country has ever developed advanced manufacturing without tariffs (see development economist Ha-Joon Chang’s "Bad Samaritans" and "Kicking Away the Ladder"): Colombia’s relatively small manufacturing industry needs them. To quote a friend of Ha-Joon Chang’s, Nobel Prize winner Joseph Stiglitz (in The National Interest, May/June 2008): "standard economic theory does not say that everyone will be better-off as a result of trade liberalization, only that the winners could compensate the losers. They could take a portion of their gains, give it to the losers and everyone could be better-off. But, of course, the winners, which in much of America are the very well-off, haven’t compensated the losers; indeed, some have been arguing that to compete in the new world of globalization requires cutbacks in government spending, including programs for the poor. The losers then lose doubly. "These results of traditional economic theory are based on assumptions like perfect information, perfect-risk markets, perfect competition and no innovation. But, of course, we do not live in such a perfect world. Modern economic theory has shown that in the imperfect world in which we live, trade liberalization can actually make everyone worse off." The agricultural implications for Colombia are worse. 12 million Colombians (of 44 million total) live in the countryside. The agricultural sector represents 11.4 per cent of Colombia’s GDP and 22 per cent of employment, twice the level for manufacturing. According to the CCIC report, the CCFTA will see Canadian exports doing harm to Colombia’s food security — Colombia needs duties to protect staples (it will lose its ability to protect wheat, peas, lentils, barley, beef, beans). Its pork industry will be destroyed, to the tune of 90,000 jobs. It will lose 32 per cent of wheat production, with a 44 per cent of employment loss in the sector. The agreement is skewed in Canada’s favour. Canada gets to keep tariffs on Colombian sugar for longer (17 years compared to Colombia’s 12 year phaseout). Notice that Canada seems to have a comparative advantage in every crop (except coffee and illicit crops). Although the rich countries talk about free trade and market forces, they subsidize their agriculture so that the competition is not fair (and not free market). The CCFTA is part of the physical and infrastructural re-ordering of Colombia and Canada, all to provide energy for US consumers and an alternative to Venezuelan oil. Canada’s method is to devastate Northern Alberta through tar sands development, while Colombia’s is to use vast tracts of land for the production of palm oil and sugar cane for "agro-fuels." Some of this palm oil is destined for Canada, and regulations for its sale fall under the CCFTA, and the lands it is grown on were the ancestral territories of indiegenous people, Afro-Colombians, and peasants, who had been engaged in subsistence (and often sustainable) agriculture. These peasants were displaced from their lands through violence, the results of which are going to be locked in by the CCFTA. What Canadian economic interests want the CCFTA? Canada’s mining and energy sectors, known in many parts of the world, often for abuses they commit there, stand to benefit from the CCFTA as they have from changes to Colombia’s laws in the past. Like other "free trade" agreements, the CCFTA is less about free trade than it is about investor rights, specifically the right of foreign investors to preferential treatment in the domestic economy. Quoting from Stiglitz again (The National Interest May/June 2008): "The so-called free-trade agreements being pushed by the Bush administration are, of course, not freetrade agreements at all. If they were, they would be a few pages long-with each party agreeing to eliminate its tariffs, nontariff barriers and subsidies. In fact, they go on for hundreds of pages. They are managed-trade agreements-typically managed for the special interests in the advanced industrial countries (especially those that make large campaign contributions, like the drug industry). The United States keeps its agricultural subsidies, and developing countries are not allowed to impose countervailing duties. And the agreements typically go well beyond trade, including investment agreements and intellectual-property provisions." Canadian investment in Colombia is $3 billion today, and will go to $5 billion in the next 2 years, mostly in mining and energy. Oil & gas companies include Nexen, Enbridge, and Petrominerales. Enbridge owns ¼ of the OCENSA pipeline (800km, guarded by 1400 soldiers). Ocensa Consortium hired Defence Systems Colombia, which worked with the Colombian army in the region (see Asad Ismi, Profiting from Repression, online report 2000). Coalcorp explores and has ports and railways in Cesar, Santander, and La Guajira. Mining companies include B2Gold from Vancouver, and Toronto’s Colombia Goldfields. As Colombian mining union activist Francisco Ramirez documents in his book, The Profits of Extermination (Common Courage 2005), Canadian mining has a long and scandalous history in Colombia. For example, the Canadian International Development Agency and the Canadian Energy Research Institute (CERI, an organization representing over 100 top Canadian financial, mining and energy companies) helped create Colombia’s mining, petroleum, and environmental legislation. The mining companies that support CIDA-CERI benefit from the laws. Some of the changes to Colombia’s 2002 Mining Code: In Article 7, "excluded" areas become "restricted" areas (national parks, national reserves, sanctuaries). In Article 99, environmental agencies lose their power to revise and challenge mining plans. In Article 29, "first come first serve" — specifically removes the small miners’ claims to some of the mines. The miners, often artesanal miners, were the first to work the mines, but speculators who filed claims through confusing mechanisms through their access to the state or to lawyers, were able to claim the small miners’ mines. Most chilling of all was Article 128, "Program of Economic Substitution", which put in place programs to help the displaced, before there were people displaced. In the Colombian context, this amounted to an announcement of plans for displacing people. Other changes: The state mining agency, Mineralco SA, was liquidated. The term for concessions held by foreign firms went from 25 to 90 years. The royalty tax went from from 10-15 per cent or more to less than 4 per cent, meaning that the Colombian state (and thus its public) gets virtually no benefit from allowing the devastation of its lands through mining. Securitization, or institutionalized gambling, was introduced in the mining sector (perhaps this is "modern economics"). The state role in environmental assessment was removed in favor of "third party" (private) investment. After these changes, Canadian companies got 73 per cent of new exploration contracts. The CCFTA plays a role in energy planning for the needs of the US in future. If Harper’s vision is of Canada as an "energy superpower," to be accomplished through the destruction of northern Alberta by tar sands development, the CCFTA envisions Colombia becoming a palm oil superpower, with massive plantations of foreign-controlled palm, growing biofuels under dismal conditions for workers, food security and biodiversity. Is Colombian trade so centrally important to Canada? No. Colombia is Canada’s fifth trading partner in Latin America, after Mexico, Brazil, Chile, and Venezuela. As harmful as the economic aspect of the CCFTA will be to Colombia, it is incremental damage to an economy already devastated from nearly two decades of such policies. The real role of the agreement is political, specifically to "launder" the idea of an FTA with Colombia for the US. Negotiations for the CCFTA were launched at the height of the "para-politica" scandal (July 2007, see my article, "Harper-Uribe Handshake") when Harper went to see Uribe. That scandal implicated politicians from Colombian President Alvaro Uribe Velez’s party, who signed pacts with paramilitaries to "cleanse" regions by killing people. Since 2007, Uribe’s government has been racked by several other scandals, including the "false positives" scandal in which Colombia’s military planted evidence (and conducted crimes) in order to present progress against "terrorism". The latest scandal was a "wire-tapping scandal" involving Colombia’s intelligence agency, DAS, which resulted in the firing of dozens of agents (see Juan Forero’s article in Washington Post May 17/09, "Top Aides Suspected in Police Case"). The Toronto Star responded to concerns about Colombia’s awful human rights record by asking (editorial, May 24/09): "What more can Canada credibly expect the Uribe government to do to improve Colombia’s human rights record?" If this question isn’t mere rhetoric, it has a substantive answer, amply documented. Uribe’s government could follow the proposals of the human rights defenders of Colombia, whom it instead stigmatizes and threatens. A recent report by the International Crisis Group (May 25/09) recommends that the international community condition "international aid to the armed forces on full respect for human rights". Trade should be similarly conditioned. The ICG report finds that the Colombian conflict is "evolving, not ending". The report concludes: "New illegal armed groups — the NIAGs — have stepped up intimidation and violence against civilians; the government’s early warning system to prevent HR violations is often useless; and the sluggish justice system is an ineffective deterrent for perpetrators of human rights abuses and those who send intimidating messages and death threats. Despite some recent measures in reaction to the mounting extrajudicial execution scandal, the security forces have a long way to go regarding accountability, professionalism and full commitment to human rights...an absolute precondition is an end to the stigmatisation by high government officials of human rights groups as linked to guerrillas." The Harper government points to "improvements" in the Colombian regime’s record, but this is the same intelligence-insulting approach they take to the climate. Human rights standards, like scientific standards, should be set: state-sanctioned murder, massacre, and displacement are unacceptable, even if the rates of these crimes are decreasing over some selected period. The Toronto Star editorial also asks: "And is the deal structured in a way that will cause ordinary Colombians to benefit, along with the ruling political class, their business partners and foreign investors?" The answer is no. See the economic analysis above, and note that labor and the environment are "side agreements" in the deal. There are no trade sanctions for violating labor or environmental rules. 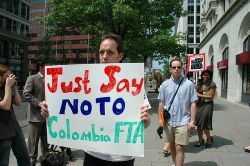 The main text of the CCFTA provides binding arbitration for disputes (in which Canadian companies routinely defeat the Colombian government,, as has occurred with CityTV and with mining companies), but violations of the side agreements (such as the murder of unionists) is to be dealt with through fines. The NDP trade policy critic Peter Julian called this: ’"the Kill a Trade Unionist - Pay a Fine’ provision. Under the provision, when a trade unionist is killed in Colombia, the government would simply have to pay into a development fund, capped at $15 million per year. This sort of flagrant disrespect for the lives of union workers is beyond comprehension." Is there any hope to stop an agreement the Conservative government is committed to and that the Liberal opposition supports? While the progressive parties (NDP and Bloc Quebecois) are opposed, the Conservative and Liberal parties are supportive of the agreement. While there is little hope for progress on any front so long as the Conservatives are in power, the Liberal party is looking for issues to differentiate itself from the Conservatives, an election may be coming up soon in which the Liberals try to replace the Conservatives, and Obama’s administration in the US, who the Liberals may want to associate with, has been reluctant to enter into an FTA with Colombia. If Liberals can be turned, the agreement will fall. Why would Liberals not support the CCFTA? Isn’t free trade a liberal policy? If Liberals are motivated by "liberal" principles - of human rights, free expression and assembly, and equal economic opportunity for all - then they should reject the CCFTA. The Colombian regime violates human rights systematically, and for reasons related to free trade agreements. The CCIC Report, "Making a Bad Situation Worse", reports that 46 Colombian unionists were killed in 2008, and 39 in 2007. These unionists were assassinated by paramilitaries that are organized, trained, and run by the military and have been found to work directly for politicians to "cleanse" territories of indigenous and peasant populations and worker’s unions. These are not speculative accusations or claims. The evidence for them has been documented by human rights organizations for decades, but in recent years it has also come out in courts of law, the Colombian media, and the international media. The Liberals latest position has been to ask for a full human rights review before voting on the agreement. This has stalled the agreement, perhaps until after an election, especially if an election is coming soon. Colombia’s President, Alvaro Uribe Velez, who bears important responsibility for the human rights violations in Colombia, is visiting Canada in June, probably to try to resurrect the agreement. The Conservatives, who are in power, have demonstrated a public contempt for human rights — indeed, their politics is partly based on this contempt. Canadians against the CCFTA hardly even bothered to write to the Conservatives, recognizing that the real power, and the possibility of exercising it, was in the hands of the Liberals. This lead to the strange situation during the Parliamentary debate (these debates are open to the public and, in this case, make interesting reading) when the NDP and Bloc were detailing reasons for opposing the CCFTA, citing hundreds of letters received to constituency offices, and the Conservatives said they hadn’t received any such letters. The anti-CCFTA campaigners didn’t write to Conservatives because there was little chance of appealing to the democratic or human rights principles of such a gang. My favourite moment was actually not the on-point remarks of the NDP and BQ critics of the CCFTA, but when a Liberal MP said that they couldn’t dismiss the agreement because they actually had a chance of forming the government. The BQ politician replied by wondering why one’s principles should change simply because one has a chance at power. The Liberals, by contrast, have a choice, and have options. If they can’t find principles, they might at least recognize the saying that when voters have a choice between a real conservative and a fake conservative, they’ll choose the real thing. Justin Podur is a writer and editor for ZNet (www.zmag.org), part of Z Communications, an alternative media organization dedicated to political analysis and support for movements for social change. He has reported from Haiti, Venezuela, Colombia, Argentina, Brazil, Israel/Palestine, and Mexico. He has also written on South Asia and North America. He has written for Z Magazine, Frontline (India), New Politics, New Left Review, rabble.ca, and other publications and is part of the Pueblos en Camino collective (www.en-camino.org). He runs a blog (www.killingtrain.com). He is based in Toronto. It is easy to talk about a country problem when you are outside. Only when you live in Colombia for long time, you can understand how it works. Most of the people in Colombia like actual government; that’s why Uribe got popularity over 80%. The Rebels and The union people know how to persuade some people and they know how to cover all bad things that they have done, so It’s easy from outside to judge the government and to support Rebels ideas. Although Canadian people don’t want the FTA with Colombia, we know it is a good way to go on with our lives because the people that really want to take this Country ahead are going to have more opportunities to work. So, please, not only think on those people that belong to "Guerrilla" or "Union groups", think on people who everyday weak up in the morning to work in a company that, If you close this door, soon it’s going to get lay off, because we don’t have enough market to sell our products. And for sure.. We are majority. Thanks.